An old Carbon Combat promotional poster. 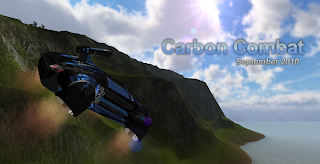 Carbon Combat is an online multiplayer game set in the near future. Players wage battles over the internet using sleek cars and tanks. A wide variety of high-quality maps and easy to learn controls and handeling make the gameplay both fun and intuitive. Currently, there are four main maps planned in the game - an island map with a roaring waterfall and a still flaming space cruiser, a floating rocks map with a sky bridge extending far past the clouds below, an abandoned missile silo base featuring two underground bunkers and an array of closed and opened silos, and a deserted oil tanker shipwreck stranded on a remote atol. Other maps are being considered as well, such as a large asteroid field, a 21st century Earth dam, and a medium sized town. Currently, the official development blog for Carbon Combat is located at games.carbontechsoftware.com. Carbon Combat will be somewhat monetized with in-game advertising as the sole source. Originally, I had planned to put micro transactions into Carbon Combat, but negative responses and opinons about it compelled me to drop the idea. Carbon Combat however will have in-game credits that will be earned only by competing in online matches and will be directly based on performance during the game (shot accuracy, kill streaks, number of kills, number of deaths, etc.). The expected release date of Carbon Combat is December 2010 - changed from two months ago when I made promotional posters that said it would be ready by October 2010. Other responsibilities in life are the main cause of this push in the release date. If you have any suggestions, comments, or questions, please contact me via email, Skype, or Private Message. See the About the Developer page for contact information.